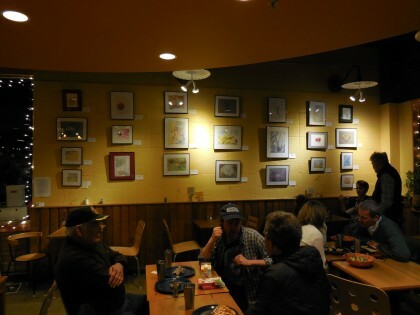 You may remember the mention I made in my post Then and Now: My Art Opening Night of the raw carrots and apple slices I had asked for as part of the food to nosh on while mingling and looking at the art. After the reception was over and we were packing everything up, Sandi asked me if I’d like to take what apples and carrots were left home with me. Of course I said yes. The carrots were the “baby” ones–organic, but peeled and shaved down to a munchie size, with no skin. Honestly, this isn’t my favorite way to eat raw carrots. I’m such a vegetable nerd that pretty much every day I do a good imitation of Bugs Bunny: I love to just take a whole carrot out of the frig and bite into its unpeeled whole goodness. I get the earthy taste of the vitamins in the skin, and I guess that also means I’m not slicing it in a way to lessen the nutrients. (I’m not cooking it either, which in some circles is the only way to enhance some of the carrot’s nutrients, but I’m getting a good amount of vitamin C, and what I call a cheerful shot in the arm on a gloomy winter day. And I get to crunch, which I love to do.) In fact I love to eat carrots this way so much that I regularly buy the 5 lb bags of organic ones meant for juicing, only I just chomp on them one at a time. Sometimes I eat 3 or 4 a day, but almost always I have at least one. All this to say that I wasn’t particularly thrilled to eat these carrots raw day after day. So I decided to come up with something easy that would combine both the carrots and the apples, before I ate all the apples, and didn’t know what to do with the carrots. Since the apples were already sliced and I had sprinkled a little lemon juice into the bag they were in, they were basically ready for anything I wanted to do with them. Being the lazy cook I am these days who would rather draw or paint than make a complicated recipe, I hoped the shaved little mini carrots would not need to be made smaller or thinner. But just for good measure, I sliced the larger ones in half, so they might have a chance of catching up in cooking time with the apples. This dish is more of an opportunity than a recipe. But it was so sweet and good and unusual that I’ll do my best to write it up in recipe form so you can try it out if you like. It reminds me of a name one of my friends gave herself years ago as we were all sitting around eating vegetarian food at a women’s gathering potluck. Some were saying whether they were vegetarian all the time, or if they ate meat sometimes. She piped up brightly with the exclamation that she was an “opportunivore” and we all laughed. It’s hard to be an “opportunivore” when you can’t have meat, dairy, added oil, soy, gluten, or any number of things (like processed sugar) that don’t work for your particular digestive system, or are off the plate for ethical reasons. So I was especially pleased when I saw this “opportunity” and that it was easy and fun. And just to be sure, I plied my neighbor Ashley with some before posting it here. She gave it the thumbs up and said I should post it. How can I refuse a face as sweet as this one? I can’t decide if this bake should be a dessert or just an unusual part of dinner or lunch. It’s “sweet” because of the ingredients in it, but not because there’s any added sugar. The earthiness of the carrots, spices and a little bit of red onion give it a savory dimension as well. And it’s great with a dab of stone ground mustard on top. So you decide: leave out the onion, tumeric, and the dab of mustard and you’ve (almost) got a dessert. But I think these unusual additions make this a delicious something a little out of the ordinary. 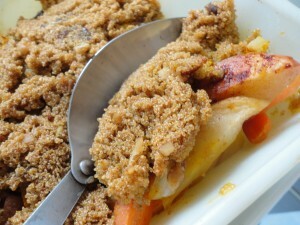 Place the sliced apples and carrot in a quart baking dish and splash with a tablespoon or so of lemon juice. Toss until all are coated and add more if needed (you really can’t have too much). Sprinkle generously with cinnamon and ginger and add about a 1/4 teaspoon of tumeric, or more to taste. Chop a medjool date into small pieces and mix it into the amaranth with lots of ground cinnamon, ginger and about 1/4 tsp of tumeric and an 1/8 teaspoon of cumin, and the chopped walnut. Spread the mixture over the spiced apples, carrots and onion. Bake at 350 uncovered for about 35 minutes. Cover and bake another 5-15 minutes to help soften up the carrots a bit more. Notes: if you slice or julienne regular carrots they may not take as long to cook as the whole or almost whole “baby” ones. I kind of liked them just a little crunchy. How I cooked the amaranth: I heated a small pot for about 30 seconds over medium heat, then put in half cup of amaranth and toasted it every so lightly for about another 30 seconds. Then I added 2 parts water, so one cup. Often recipes say to use 3 parts water to one part amaranth, but I wanted it to be a bit crunchy in the bake so I reduced the water. Either way will work for you though. Even after all this, I still had some of those baby carrots left over. In my next post I’ll share a “vegan version” of what I did with them. I share your taste for raw carrots in the skin! I often crunch them at work. But I also love them steamed. Just like that. Carrots are vegetables that work for me even without spices. But I love them in stir fries too. They are the one vegetable I can eat without adding salt and not missing it. I love your skill in putting things together in your recipies, simply looking at what you have on hand. It is really inspiring! I started to do that too and I am quite happy with the results. It is simple, saves time an I like it! Thanks for sharing these things! And by the way, I would have loved to buy one of your pictures! I don’t wonder you sold so many! Thanks so much, Silvia! So fun to hear you like raw carrots in the skin as much as I do! Nice I have a “carrot sister” across the globe. 🙂 I so appreciate your calling my putting what I have on hand together into something a skill–I am really glad you find it helpful. After 6 years of eating this way, things just seem to get more simple. 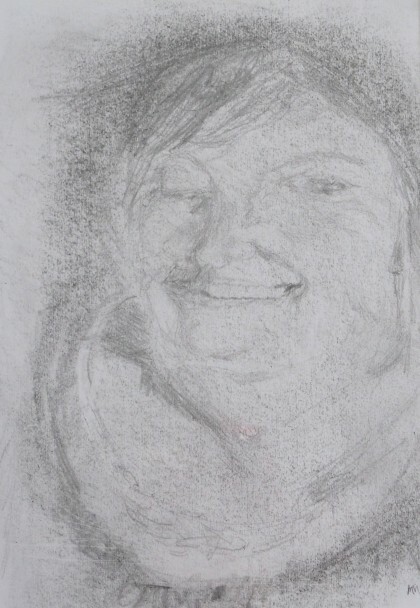 And thank you for the lovely compliment about the art, which makes me very happy. Of course you are always welcome to inquire through e-mail about what has sold and what hasn’t, but alas, the shipping to Germany would probably be in the $25-35 dollar range. Unfortunately there is customs and duty to pay and that goes also for shipping costs which is really hard! So I have to pass on your pictures. And I am a fan of the beets and understand completely that they sold so early! But thanks for offering, Maria. Maria, this looks so interesting! I keep having to remind myself that it’s not a dessert because the amaranth on top looks so much like brown sugar. Thanks Susan! It does look like brown sugar doesn’t it? 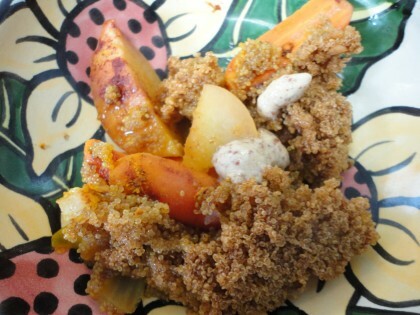 Amaranth takes well to sweet things, so this could be made into a more conventional dessert if the carrots and onion were left and it was made with just apples, or pears, or even peaches, and the conventional “dessert” spices for baked fruit. Looks awesome!! Another creative win for you. 🙂 An inspired combination to get rid of leftovers – I’ll have to try something similar with what’s left in our fridge/freezer! I usually peel carrots I get from the store (even organic), just for neurotic reasons, but the ones from the CSA and home-grown – I never peel. Definitely tastier and more nutritious! Can’t wait to try this! Thanks, Maria! This sounds like a very tasty combination bridging the gap between sweet and savory! (Maybe it could become a breakfast/brunch bake…?) “Opportunivore” is a great word; I used to go by “flexitarian,” but I like opportunivore better. Either way, being fully vegetarian now and further restricted by being gluten-free, I like you don’t have many opportunities to seize opportunities (or be especially flexible). Glad you were able to take this one when it came your way!